Pro 2 is basically a two man race with Ola Jaeger having a very slim chance to win the championship, but he will be eliminated once Dylan Hughes or Travis Reeder makes a qualifying pass. Dylan finds himself 40 points back right now before the last round. Last year Travis Reeder lost by just 2 points in a wild finish so Irwindale promises to be exciting! 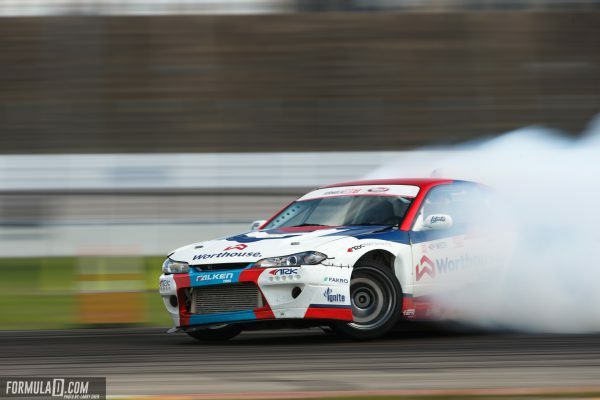 The Rookie of the Year Race is another close one going into the House of Drift. A close three-driver race between Matt Vankirk, Dirk Stratton, and Kazuya Taguchi is on! Just 15 points split up Matt and Dirk with Kazuya another 19 points behind Dirk. I like this race and any of these drivers pushing into the Top 16 will likely lock them in as ROTY in 2018. While Piotr Wiecek won the event this weekend I think Kevin Lawrence really took him to task in the Top 32. It was that close of a call and in case you skipped the Top 32, I highly recommend you head over and see how hard Kevin Lawrence pushed Piotr in their battle. Ryan Litteral has been notably absent for a large chunk of the season but he came out to perform in Texas. His Koruworks Nissan 350z was looking great this weekend and it showed by him beating the rookie Kaguchi in Top 32. He capitalized on a huge mistake from Hohnadell in the Top 16 and then finally met his match with DeNofa in the Great 8. A respectable performance from a great drifter was on display this weekend. Sadly it sounds like his crash with Hohnadell did some damage to the car that carried over into his Great 8 battle where he lost. Jeff Jones has been a silent assassin this season in his Nissan 350z. 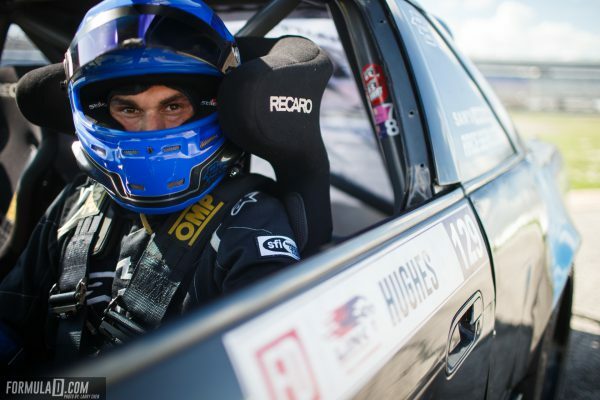 He took out Dan Burkett in Top 32 and then really threw down against Ryan Tuerck in Top 16. His progression and consistency has been highlighted so much by his new Z33 Nissan build. I look to see him fighting for a Top 10 championship spot next season. I’m just over it. 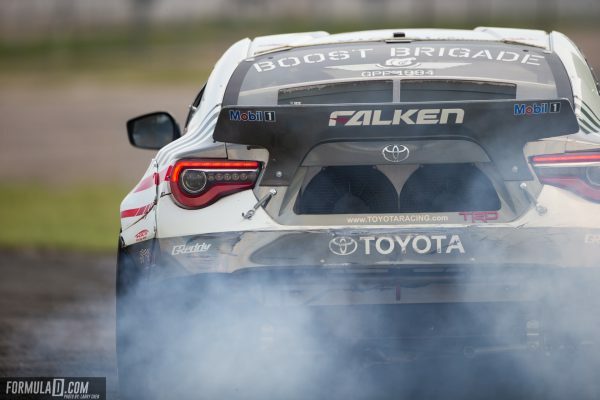 The most hyped battle in Formula Drift history perhaps will never happen in a clean way. I wish someone could explain to me why these Worthhouse cars only manage to break and explode when they battle each other. It’s never going to happen but a Top 32 meeting of these two would make the championship chase really wild. I know this was a confusing one to many fans but Forrest Wang was caught using the brakes in a non-braking zone that the judges then faulted him. In the drivers meetings the judges did make it clear that if you slowed down in any fashion between the middle of turn one and inner clip two, and the chase driver was affected, the lead driver would be at fault. Looking at the battle again, this is exactly what happened as Wang hit the brakes and ruined Vaughn’s drift line as he had no where to go. Travis Reeder took home another victory that was delayed a whole entire day due to weather. This did not stop or slow down Travis Reeder in his Nissan 240sx. This resulted in him winning his third Pro 2 event and is now level with Marc Landerville for the all-time Pro 2 record. 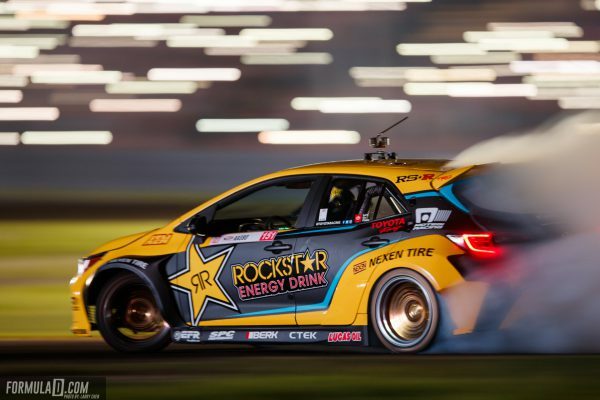 The only real hope to stop the back-to-back championship falls in the lap of Fredric Aasbo. He currently finds himself 49 points behind the reigning champion James Deane. Fredric Aasbo needs to put his focus on winning the event and hoping that Deane falls short somewhere earlier in the event. 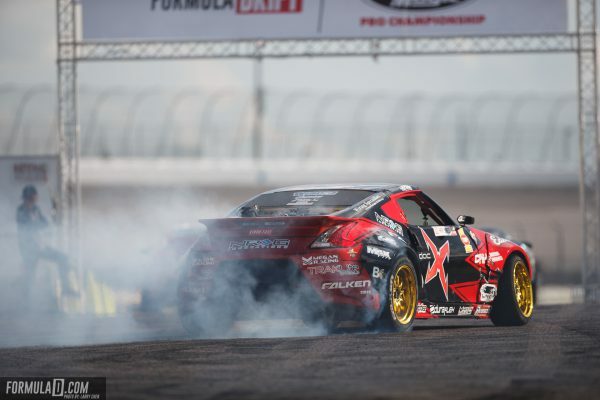 No matter what, the House of Drift seems to deliver some great drifting entertainment and the countdown to Irwindale Speedway has begun to complete the 15th season of Formula Drift!